The Asian Studies Development Program annual conference is underway, with over eighty participants registered for the event. Much planning is required in preparation. This year, the conference will honor the memory of the esteemed philosopher and translator of Confucian texts Dr. Henry Rosemont. Dr. Roger Ames, Dr. Elizabeth Buck, and Dr. Peter Hershock will remember the important role Henry played in their scholarly journey towards understanding Asia, but most particularly, China. Learn more about the conference, which will convene at the Georgetown Marriott, 1-3 March 2018. Karen Nunan continues to serve as a member of the East West Center Association Executive Board. Support for Nepalese students: We have continued to support our two Nepalese students through their tertiary studies. Lasha Manandhar is now in her final year of nursing studies in Bangalore, India. We have sent a graduation gift of $400 to Lasha via the Nepal Australia Friendship Association NAFA. Sunu Rai completed her formal coursework in fashion design and manufacture in June 2017 and now has secured a job in clothing design in Kathmandu. We held our Chapter meeting on December 1 at the home of Iraphne and Ralph in Brisbane. Australian Red Cross, Queensland – two Chapter members, Karen and Iraphne, continue as emergency volunteers based in Brisbane, but ready to be deployed anywhere in Queensland if needed, especially during our summer months when cyclone and flood events often occur. Support the Center with financial contributions – Chapter members are encouraged to make contributions to the Center individually. Contact information to update list to the Alumni Office – Most Affiliate members live in other cities in Australia and so dues are optional. We ask that they let us know when they are in town, so we can try to offer some hospitality, and can keep them informed of our activities so they can join in if they wish. Chapter Meetings—The Chapter held two meetings since the last reporting period. Social Event of the Chapter—The Bangladesh alumni organized a get together during the last quarter. The event took place at the residence of Professor Md. Abdul Mannan, Chairman of the University Grant Commission. The main event was a dinner sponsored by Moushumi Das Purkayastha. Promote the activities of the OPS, a rural social and community development organization centered around the school—The chapter has been actively considering a support program to the school of the Zinda Park being operated under the auspices of the local rural organization named Gropothik Palli Samity (OPS). The chapter members will soon visit the school to determine specific needs of the school. Mohammad Shahjahan has been residing in the US since 1981.at various places namely, Orlando and Miami, Florida, Las Vegas, Nevada, and now in Hollywood, where he works for Starline Tours, which is a Los Angeles, California based business and has been operating as a tourism company since 1935. Shamsuddin Ahmad was affiliated with EWC -RSI program in the year 1989. Update: This is the last quarter of 2017. A couple of new alumni joined the wechat group and the total number is now more than 150. We appreciate the EWC Associates Office for linking us up with the new alumni. On 24th December, the alumni in Beijing had a New Year party in a small yard. The chapter leader, Hongxia, and seven other alumni joined the party. Future alumni operations were discussed. Challenges: It was suggested that we link up with Peking University where there is an office for alumni. Due to the change and communication gap, the current alumni leader has not yet been able to contact them. Support needed: More visits from EWC are requested next year to provide a better chance for the alumni to understand the current EWC situation and how we can contribute. Partial list of Activities Fall Quarter 2017 – On Saturday, Aug 19, 2017 the Hawaii Chapter hosted over 125 incoming East-West Center students and alumni at the annual CBI picnic in Kapiolani Park. Alumni prepared BBQ picnic style food for the students, along with members of the CBI committee & EWCPA. 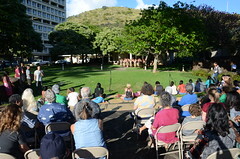 The Chapter also provided a talk on the history of Kapiolani Park, Diamond Head and Oahu for the students. Each year this proves to be an excellent way to network with students who are future alumni of the East-West Center. On April 22, 2018 the Hawaii Chapter will once again hold the Annual Dinner and Fundraiser at the Pacific Club. A much anticipated event, the evening is attended by over 150 alumni and friends. The Hawaii Chapter uses a portion of the funds raised to sponsor 5 EWC students to attend professional conferences with travel stipends. The Chapter also continues to hold regular monthly meetings in 2018 in the President’s Conference Room in Burns Hall. EWCA-Japan (Kansai) Chapter (hereinafter called Kansai Chapter) was engaged in the following activities between October 1, 2017 and December 31, 2017. Open and closed seminars held at Kansai University on June 4, 2017 were reviewed based on the questionnaire survey conducted by Prof. Anderson. We were so glad to find out that most of the students were satisfied with our seminars. The administrative structure of the Kansai Chapter for the following two-year period (2018-2020) was briefly discussed. We will continue to discuss this matter at the second board meeting to he held sometime in April 2018. The EWCA Tokyo Chapter organized its Board meeting on Dec. 27, 2017 at the Headquarters of the United Nations University (UNU). The Board meeting was attended by Chie Hashimoto, Yasuo Hoshino, Ruriko Kumano, Misato Matsuda, Kazu Takemoto (Chapter Leader), Kazuko Tonoike, Matori Yamamoto, Michiko Yamashita, Yasutaka Yano, Masayuki Yokota and Hitomi Yokote. In addition, Mr. Taka Tsuchiya (Auditor) kindly joined this meeting. Board expressed its sincere thanks to the outgoing Board members, Prof. Yasutaka Yano and Prof. Kazuko Tonoike, as well as to the outgoing Auditor, Mr. Taka Tsuchiya for their outstanding contributions to the EWCA activities. 2018 is the year the Korea Chapter is hosting EWC/EWCA International conference. There have been a lot of discussions and meetings since the Korean Chapter decided to hold the big conference in Seoul. Many people wholeheartedly joined the plan and worked hard. Through their effort, the big frame of the meeting is complete and there is only fine detail adjustment to take care of. The theme of the Seoul conference is Intercultural Engagement in the Asia-Pacific Community. However, within the framework of the large theme, we are dealing with issues that are highly relevant for all of us living in a historical moment that is rapidly becoming unfamiliar. Some examples of the issues under consideration are Cultural Diversity and Techno-economic Convergence, Future Educational Revolution in the Hyper Connected Society and Healthy Aging, etc. The issues are going to be dealt with not just from the expert’s perspective but from vivid experience of all of us heading for the future that we have never seen before. These topics are more meaningful in that Korea is a nation that has achieved the miracle of the Han River in less than a half century from a country devastated by war. 2018 EWC/EWCA International Conference in Seoul is the second of its kind held after more than 40 years. During the past decades, Korea has been experiencing radical change with positive and negative things that accompany it. It’s both timely and appropriate to discuss the above mentioned topics. One of the issues that inevitably goes along with hosting such a big conference is fundraising. Alumni from University of Hawaii and EWC have been very helpful. Once again, EWC Alumnus Myung Seok Park has shown exceptional generosity. However, we know that the most meaningful source of funding is from participation in the 2018 Seoul International Conference. Please make plans to join the conference and meet international colleagues! The Laos Chapter had no activities to report, and wish everyone Happy New Year 2018. The Malaysia Chapter had no activities to report. The Nepal Chapter participated in the Fulbright Monthly Public Lecture and Policy Discussion Series 2017, celebrating the 70th Anniversary of US- Nepal Relations. On 31 October 2017, representatives from the Nepal Chapter heard a lecture on “Health Care in Rural Nepal in Times of Change.” Speakers included: Mr. Mark Arnoldy, CEO, former Fulbright Research grantee; Dr. Bhagwan Koirala, Cardiothoracic Surgeon, Professor and Social Worker; Dr. Shrijana Shrestha, Dean, School of Medicine, Patan Academy of Health Sciences. Tom Robertson, Ph.D. Executive Director, Fulbright-Nepal, served as Moderator for this public event. The venue was Patan Academy of Health Sciences, Lagankhel, Lalitpur, Nepal, from 2:00-4:00 p.m.
On 28 November 2017, representatives from the Nepal Chapter heard a lecture on “Water, Power and Environment: Relations Reflecting on Resource Development in Nepal.” Speakers included: Dipak Gyawali, Nepal Water Conservation Foundation; Pooja Sharma, Head of Energy Programme, Practical Action, Nepal; Santa Bahadur Pun, former Managing Director of the Nepal Electricity Authority; Moderator: Tom Robertson, Ph.D. Executive Director Fulbright- Nepal. The location was Shangrila Hotel, Lazimpat, Kathmandu from 4:00- 6:00 p.m. In celebration of the 70th anniversary of diplomatic relations between the United States and Nepal, the US Embassy and the Fulbright Commission/USEF-Nepal hosted a policy discussion with Ambassador Alaina B. Teplitz and Dr. Shankar P. Sharma, Nepal’s former Ambassador to the United States. On 19 December 2017, representatives from the Nepal Chapter were cordially invited to attend the final lecture of this year’s series titled “The Next 70 years and Beyond” at Shangri-La Hotel, Lazimpat, Kathmandu from 4:00 – 6:00p.m. The objective of the meeting was to share our experiences as alumni and how we could contribute towards Nepal’s prosperity, especially discussing issues of accountability, tackling corruption, promoting entrepreneurship, women empowerment etc. We expressed ways we could partner in the U.S. Embassy’s role in reaching out to the Nepalese community through its various activities. Ambassador Teplitz and Dr. Sharma delivered remarks followed by most interesting relevant and invigorating Q&A. The event was moderated by Public Affairs Officer, Mr. Tristan Perry. The USG Alumni meeting with Mr. Nolan Johnson, Public Diplomatic Desk Officer, SCA/PPD from Washington DC. Location: 3:15 -4:00p.m. at Lasana, Maitre Marg, Patan. Mr. Baral, Sijan R, Alumni Coordinator, called the meeting. It was hosted by Asmina Ranjit. Nirendra Dhoj Maske briefed the meeting on the mission and vision of the East- West Center and the EWCA, and how we plan to address the challenges of the 21st century. The APC Proposal Team to research a possibility to open an International Organization (Asia Pacific Center-APC) in Okinawa held a discussion meeting and a public symposium at Musashino University in Tokyo on December 8 and 9. Mr. Choko Takayama, adviser for the Okinawa Chapter and other four members from Okinawa Chapter attended the Tokyo conference. 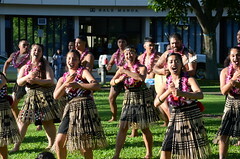 The purpose of the Proposal Team was to open the International Organization in Okinawa modeled after EWC in Hawaii. The Proposal Team was led by Mr. Choko Takayama from the Okinawa Chapter and Mr. Teruyuki Kume from the Tokyo Chapter and other members of EWCA in 2014. The Proposal Team believed that living, studying and communicating together would lead to understanding each other beyond national boundaries and interests and then promote peace and development. About 10 members of the Proposal Team gathered at the discussion meeting and exchanged views to make plans aimed at petitioning the Japanese government and Okinawa prefecture government. About 100 participants attended the symposium on the theme “Tasks and Prospects of the Asia Pacific Center Proposal” and voiced their opinions on the plan which was drafted by the Proposal Team. Mr. Takayama, co-leader of the Proposal Team emphasized the role of the international organization (Asia Pacifica Center) in Okinawa, because of Okinawa’s geographic location and history of exchange with Asian nations and areas, and the Pacifica region. The Proposal Team will continue to research the possibility for the International Organization in Okinawa and to create a suitable plan which promises to persuade the Japanese government. Mr. Chosei Kabira, former director of Okinawa Broadcast Association and now a Professor Emeritus of Showa Women’s University, accepted a position of adviser to the Proposal Team. and a business forum in the afternoon. On Oc t22, members of the chapter were invited to participate in a conservation program at a wildlife corridor in Malaysia. An introductory talk was given by Dr. Kae Kawanishi from the Malaysian Conservation Alliance for Tigers (MYCAT). The program inspires people to value and protect the world’s most iconic and critically endangered tigers and their habitat. The Singapore chapter can link up with the Malaysia chapter for a joint project if they are interested. Two core problems threatening the biodiversity are being discussed. They are people’s disconnect from nature and the loss of forest cover, its connectivity and ecological integrity. Has Gunawan and Alice Seng have expressed interest to look into the details of this conservation project. On Oct 22, Dr. Vilma D’Rozario from a non-profit organisation, Cicada, offered to raise the senior chapter alumni’s awareness of Singapore’s nature reserves which are being threatened by the rapid rate of urbanisation. A few members of the chapter supported a sharing given by Dr. D’Rozario. On Nov 1, three EWC alumni from the 70s managed to connect with each other and had an unforgettable reunion in Bangkok. The three, Dang Peansiri Eckynom from Thailand, Bonnie Dong from Hong Kong, and Alice Seng Seok Hoon from Singapore, met for the first time after more than 35 years!! They took one week just to catch up with each other. They promised to continue meeting at the 2020 anniversary alumni conference in Honolulu and will request to stay in Hale Manoa 12th floor where they first met in 1977. On Dec16, members of the chapter participated in a community service project by the Singapore Children Society. It is a 3G (three generational) garden project involving grandparents and kindergarden children from a housing estate to grow flowers, plants and fruit trees together in a community garden. Everybody, young and old, had a very good interactive time. It is hoped that this will be an annual event and more chapter friends will take part. The EWCA Southern California Chapter met on Saturday, October 14, 2017, at the home of Gary and Bach Mai Larsen. Thanks to our hosts Bach Mai & Gary Larsen for a wonderful EWCA So CA gathering with 25 of us on Oct. 14th, 2017. Thanks to everyone for sharing special highlights, especially endeavors benefiting others in the US & internationally, including our chapter’s achieving our goal with contributions for the EWC Alumni Scholarship Fund. Fascinated by the culturally and linguistically enriched Atyal Tribe of northern Taiwan, EWCA Taiwan Chapter President Frank Hung meticulously organized a one-day tour for cultural exploration amid the remote mountainous area in Yilan County. Ten EWC alumni and friends joined the unique tour. Located deep in the mountains, the Atyal Bulaobulao Village is not easily accessible. Shuttling jeeps were provided for transporting us along the steep trails. Upon our arrival at the “sacred” Atyal territory surrounded by dense forests, singing creeks and mysterious fogs, we were welcomed by the tribal dance with impressive hospitality. The Bulaobulao Village claims to be an autonomous commune, with farming, rice wine distilling, weaving and spinning, creative carpentry, poultry raising, food service and hunting, etc., shared by all. All the traditions handed down from the seven tribal elders have been practiced for centuries. Despite the infusion of contemporary technical conveniences and the IT advancement, all the traditional customs and practices have been enforced to showcase the beauty of the Atyal Tribe. The tribe members enjoyed drinking, but never indulged themselves to be alcoholic. 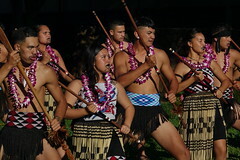 They entertained us with singing and teamed-up dancing in the open air surrounded by mountain ranges. To preserve the cultural heritage and traditional authenticity of the Atyal Tribe, Bulaobulao Village is limited to only 30 visitors each day. Our memorable tour to the Atyal Bulaobulao Village did not end until long after the sun set. EWCA Taiwan Chapter members gathered at Atyal Bulaobulao Village for an outing on Dec. 27, 2017. Frank Hung (5th from right) is the EWCA Taipei Chapter President. This entry was posted in Alumni, EWCA Chapters, Uncategorized and tagged EWCA, EWCA ASDP Chapter, EWCA Bangladesh Chapter, EWCA Beijing Chapter, EWCA Brisbane Chapter, EWCA Hawaii Chapter, EWCA Kansai Chapter, EWCA Laos Chapter, EWCA Malaysia Chapter, EWCA Nepal Chapter, EWCA Okinawa Chapter, EWCA Philippines Chapter, EWCA Seoul Chapter, EWCA Singapore Chapter, EWCA South California Chapter, EWCA Taiwan Chapter, EWCA Tokyo Chapter. Bookmark the permalink.